Several visitors of the Point Pleasant River Museum delighted in seeing the various river fish. POINT PLEASANT — The scheduled release of the Point Pleasant River Museum’s fish on Wednesday afternoon has been cancelled. Jack Fowler, Point Pleasant River Museum director, shared West Virginia Division of Natural Resources (WV DNR) will not allow the release of the fish into the river. The return of the fish is prohibited by a West Virginia state law, WV DNR explained to Fowler, even though the fish originally came from the river. Fowler inquired a representative of WV DNR about the possibility of tagging the fish as a way to keep an eye on them while in the river and was then informed of the law. 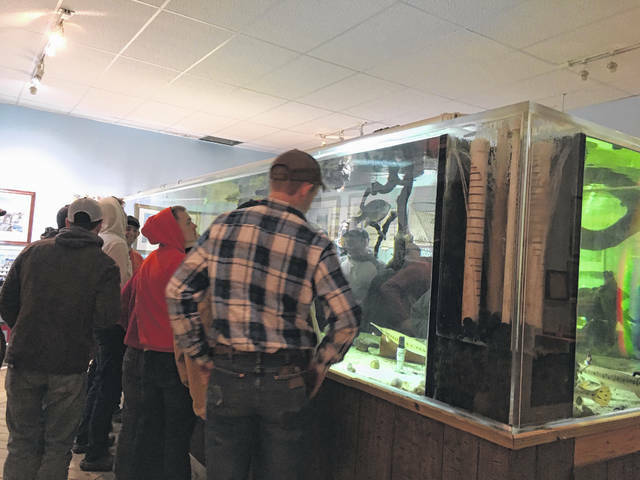 Three gar, two carp, a catfish, and a striped bass have lived in an environmentally protected 2,400 fish aquarium for approximately 7 years at the river museum commented Fowler. During the fire at the museum earlier this month, the fish survived and have kept their wellness. Fowler explained maintaining the fish costs $35 a week and currently there is no way for people to come in and view them, so it was decided the fish needed a different location as their home. The original plan for the fish, explained Fowler, was to have them released at the old ferry boat landing at the end of Main St., Point Pleasant, near Tu-Endie-Wei State Park. He commented he and his fellow staff members of the river museum had cleared the drift wood away for the event as the public was invited to see the fish return to their natural habitat. However, since the fish are not permitted to return to the river, they have been offered a home in a Mason County resident’s farm pond. Fowler shared how pleased he is to have a local land owner step up and take responsibility of all the fish, especially the three gar which are typically not pond fish. Fowler shared when the right time comes, the fish aquarium will be restored with new fish from the river. In addition, the river museum still has tickets on sale for the upcoming dinner cruise on the Belle of Cincinnati. Call the river museum for tickets at 1-304-674-0144, ask for Martha or Ruth. The dinner cruise is set for July 30, with boarding at 6:30 p.m. and departure at 7 p.m. from Point Pleasant Riverfront Park. Tickets are $50 for adults and $30 for children ages 4-12. Fowler commented the dinner cruise will be an interesting experience and those who attend will enjoy their time. https://www.mydailysentinel.com/wp-content/uploads/sites/14/2018/07/web1_0316.River4_.jpgSeveral visitors of the Point Pleasant River Museum delighted in seeing the various river fish.